When children participate in music, they are more easily able to regroup, shift focus, pitch in and learn while maintaining their connection to each other, their teachers and the day's events. The songs in this book are categorised by seven transition types - greetings and good-byes, gatherings and dismissals, calling attention, cleaning up, moving, waiting, and slowing down - each requiring a different kind of song and mood. A CD is included that teaches the melodies for all 69 song, and the song lyrics are formatted so that song cards can easily be made. 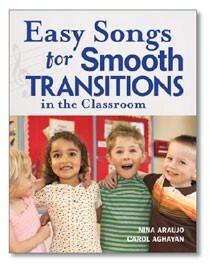 The introduction encourages teachers to be unafraid and sing for and with children. This benefits both the teachers and children alike as it reduces stress, requires us to be open to improvisation and encourages physical and emotional development. Music encourages us to use our whole bodies while also stimulating our minds and satisfying our emotions. It builds relationships and develops trust and a feeling of belonging. The authors discourage the use of recorded music for transistions, because it is unchanging and thus inflexable, is often inconvenient and frequently discourages participation.